Dr. Wright Presents at Annual Hernia Society Meeting in Washington, D.C. Independent study showed nerve entrapment causes pain in both. Findings discussed at national American Hernia Society meeting. PUYALLUP, Wash. — How are inguinal hernias similar to carpel tunnel syndrome? An independent team of researchers at Meridian Surgery Center’s Cascade Hernia Institute explored that possible relationship last summer. 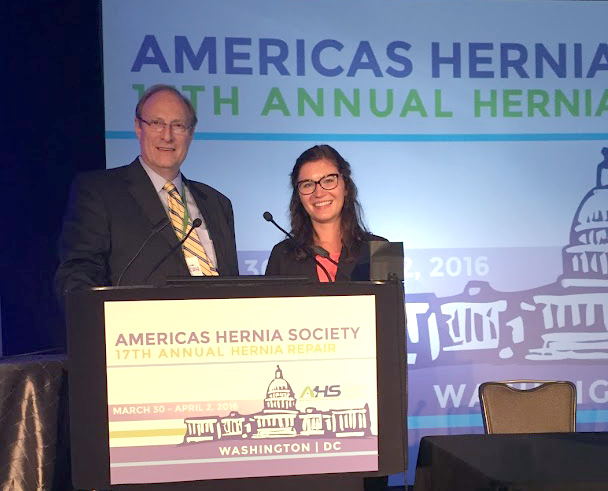 Robert C. Wright, a Puyallup surgeon, presented the research findings at an April 1 meeting of the American Hernia Society in Washington, D.C. The study showed that in 63 percent of hernia patients, inguinal nerve enlargement was similar to entrapment neuropathy in carpal tunnel syndrome. “The hernia in the groin entraps a nerve and injures it, which causes swelling much like the nerve injury seen with carpal tunnel syndrome,” said Wright, Meridian Surgery Center chief surgeon. Wright said the five-year study is the most comprehensive research that he has performed. His research partner was Don Born, MD, PHD, is a neuropathologist with Stanford University School of Medicine. As with all of his independent research efforts, Wright involved undergraduate and graduate students in his most recent study. Sumner native Larissa Hurd, a 2014 Pacific Lutheran University graduate, current master’s student in biomedical sciences at Midwestern University in Glendale, Ariz., had a lead role in the latest effort. Hurd, is applying to medical school, secured study design approval from MultiCare Health System’s human research committee for the study and performed initial data organization and collection. She received a travel scholarship from Midwestern University to attend the American Hernia Society conference and will write an article about her experiences for her school newsletter. Gig Harbor native Natasha D’souza, a third-year osteopathic medical student at the Pacific Northwest University of Health Sciences, assisted with clinical chart review data collection and quality review. Rachel Gill, a native of University Place who is a premed student at Creighton University majoring in public health, also performed chart review and data collection. Daniel Wright, Washington State University graduate with a degree in economics and philosophy and a master’s in natural resource management, assisted with the writing and study presentation. Wright requires all research students to pass a human subjects research course before they assist with research. He has a sense of duty about extending independent research internships to students. “When students have the opportunity to participate in research, they get an in-depth look at the clinical and non-clinical side of medicine,” said Wright. “It’s a practical experience that gives them valuable information as they invest in and plan their education—and make career decisions,” he said. Meridian Surgery Center also is home to the Cascade Hernia Institute, which Wright launched in 2011 to bring independent research opportunities to area medical students and offer the latest surgical techniques to patients. Patients experiencing GERD do not have to suffer without relief. Learn more at www.cascadehernia.com or call (253) 840-1999 or email frontdesk@meridiansurgerycenterwa.com.